Quarterback Burke Moser drops back to pass. Heading into last weekend, the Maroons were coming off a loss to conference rival Centre College. The squad stood at 1–1 in conference play and 1–2 overall , good for third in the league, trailing Centre and Berry College. A rainy day and a shaky start for Chicago sums up the first quarter for the Maroons. The Birmingham-Southern Panthers were also able to take the lead due to a bit of a hesitant display from Chicago’s defense. Scoring on an 11-yard run and an easy extra point, the Panthers took a lead of 7–0 with 9:48 to go in the first quarter. Although the Maroons responded on defense, giving up no more points within the first quarter, the South Sider offense seemed to have a little trouble finding a way to beat the Panthers’ defense. Mojo was passed around in the huddle between the first and second quarter as Chicago came back fighting hard. The Panthers gained three points on a 31-yard field goal to bring the score to 10–0. However, their defense was less effective as Chicago was able to score a touchdown by third-year Chandler Carroll and a completed extra point from second-year kicker Mike Kurzydlowski for a score of 10–7. After a return from Chicago, the Panthers they managed to score another touchdown and field goal on a 56-yard pass. With a score of 17–7, Carroll scored another touchdown, giving the team even more momentum. Fourth-year wide-receiver Syd Reynolds seemed to be playing in synchronization with fellow fourth-year and quarterback Burke Moser. Reynolds caught several passes from his teammate, gaining yards to keep pushing down the field that resulted in a final eight-yard catch from Moser for a touchdown, bringing the final score at half to 21–17 with Chicago leading. Coming out at the half, the Maroons seemed to have lost a bit of their steam. In the third quarter the Panthers were able to rebound, managing to outscore the Maroons via two touchdowns and matching extra points. 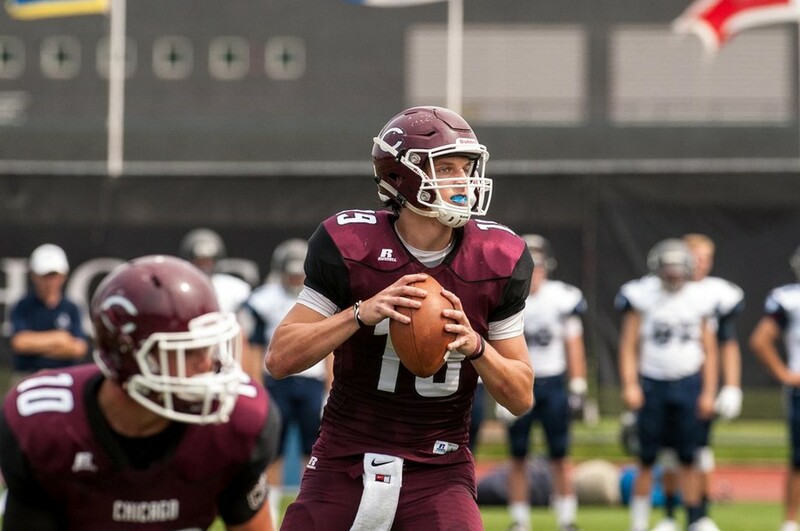 With the only rally from Chicago being a three-point, 25-yard field goal from Kurzydlowski, the Maroons ended the third quarter down 31–24. As the fourth quarter began the sun came out and things heated up amongst both teams. Due to great defensive efforts on both sides, the first points of the quarter did not hit the scoreboard until the six-minute mark, from a field goal by the Panthers. First-year Dante Nepa caught a touchdown pass from Moser at 4:16 to bring the score to a nerve wracking 34–31 with Chicago behind. After great blocks by the Maroon defensive line, Chicago was able to advance the ball. When asked what changed in the fourth quarter, Garrey said, “BSC came out and executed their game plan, but, thankfully, as the game went on we were able to get into a good rhythm and play like we know how to play.” With linemen playing cohesively, Carroll ended up scoring yet again on a short pass from Moser and a kick from Kurzydlowski brought the score to 38–34 with a little over a minute left on the clock. With less than a minute to return, the Panthers hurried to get a touchdown, but their Hail Mary pass was ineffective due to a game-saving pass breakup by second-year defensive-back Bryson Merriweather. Even though Birmingham-Southern was able to get close, the game ended in a 38–34 victory for the Maroons. The Maroons are now in a four-way tie for second place with Berry, Centre, and Wash U. ”It’s obviously good to be up there in conference standings, but we understand that every team in this conference is solid; so just as every game is a winnable game, every game is losable if we don’t come out and play like we can,” Garrey said. The Maroons’ next game is away at Berry College in Mount Berry, Georgia, on Saturday, October 8.